May Weather in the Southeast U.S. Early May continues with comfortable spring temperatures in most areas of the Southeast. High average temperatures tend to range in the 70s and 80s with low average temperatures in the 50s and 60s in most areas. The farther South you travel, the more likely it is that you will begin to experience some of the muggy summer-like humidity levels during May. 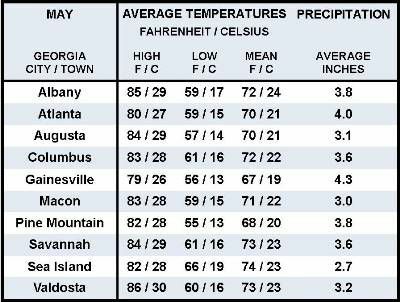 The following contains average May temperatures and rainfall for several popular tourist destinations in different areas of Georgia, North Carolina, South Carolina, Tennessee, and Virginia. Average May Atlantic Ocean water temperatures tend to range from the low to mid 60s in Virginia, reaching up into the low to upper 70s in South Carolina and Georgia and into the low 80s around Miami.